Yesterday, August 27th, was the name day of Saint Fanourios, the patron saint of things lost. His name is invoked when praying for the recovery of lost items. 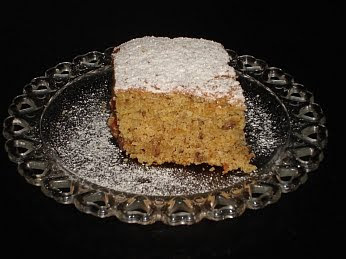 The recipe below is for Fanouropita, a cake traditionally eaten on his name day. Put the orange juice, olive oil and sugar in a bowl and stir well. Dissolve the baking soda in the must and add to the mixture. Separately, mix together the flour, walnuts, sesame seeds, cinnamon, cloves and salt. Gradually add the flour mixture to the liquid mixture and fold it in. Grease an oven dish 30cm diameter and 6cm deep and put the mixture in it. Bake in a pre-heated oven at 180 degrees Celsius for 50 minutes. 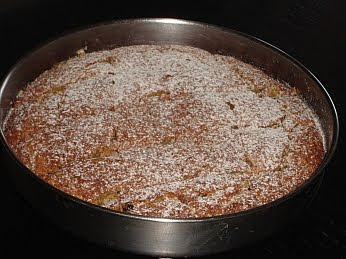 After you remove the cake, lightly sprinkle icing sugar on top. Thank you for sharing this with me...I am writing a historical fiction novel and have used your site for research.